Congrats, many thanks to all who entered. Look for a big big giveaway on Friday. Great weather today, sun is shining, buds on the trees... Spring Training is in full swing, and real baseball is just around the corner. I realize we don't talk much baseball here on FB, and that's a shame. It is a wonderful pastime, both to play and watch, and it lends itself easily to literature. 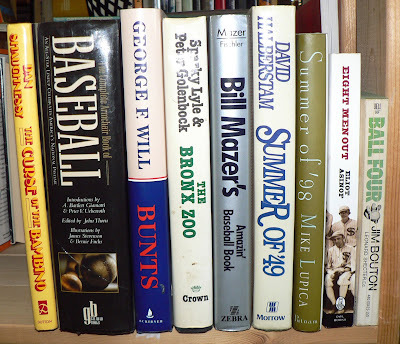 If you know me, you know that I am a huge baseball fan, and love reading baseball books. I found Emma's writing by way of the fantastic Bronx Banter, and if you enjoy baseball (and life's) little eccentricities, you are going to enjoy her work. Winner will be announced today (3/16/10) at 3:00 PM EST. Would love to win this. Somehow I have only 1 of those 9, and some of those are must-haves. jjf3 - Ball Four, Eight Men Out and Summer of '49 are must-reads. I love baseball, and I love books. Not long before opening day. Is something supposed to show up after the line If you're like me, do yourself a favor and buy this book:? Because I'm just seeing a blank space. Tricia, it's an amazon ad for "90% of the Game Is Half Mental" - my guess is that you have Adblock or something similar. O O O! I want to win! This is my husband's favorite time of year, so I would love a chance to win for him:) Thank you! Some of the best times of my childhood were playing as a "ringer" on my cousin's softball team. Yup, just bought first pair of tix to the Sox for hubby (don't tell him). Would love some reading material for the train ride down. enter me, please :) big baseball fan! My Dad loves baseball books! I'm in! ll Four made me laugh until I wet myself. I'm a huge baseball fan as well! Have worked with lots of youth travel baseball leagues and summer collegiate baseball leagues ever since I was in college. Books + Baseball - can't think of a better combination!